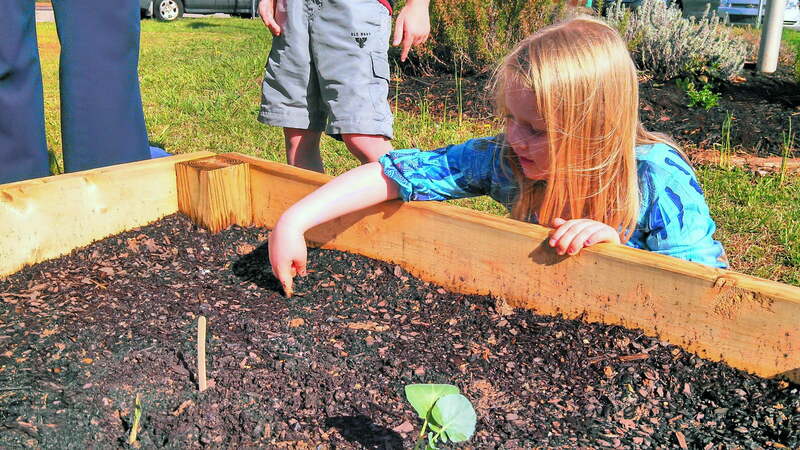 Earlier this year, ASAP’s Growing Minds program was able to award several mini-grants to school gardens in Western North Carolina thanks to funding from Roots Organic Gourmet. As the weather warms and spring gardens start to flourish, we’ve started getting some fantastic photos and stories from the teachers who received the grants. “The kindergarten teachers spent an afternoon building two raised beds for the kindergarten gardens. We put them around our flag pole in a flat area that gets full sun. After building the beds, we put topsoil and mushroom compost in them. We chose seeds based on germination and production time so that we would have vegetables to taste by the end of the school year. We also purchased strawberry, broccoli, and greens plant starts. In small groups, each teacher guided the children to read the seed packets, using literacy skills to identify the type of seed and math skills to identify the numbers to tell us how far apart to plant the seeds and how deep they should go into the ground. We referred to a ruler to see how far apart the seeds would be planted and identified the numbers on the ruler. We used the ruler and white flour to space the seeds and mark where we would plant them. We measured our fingers to be able to tell how far down into the soil we should push the seeds. Each student in each group planted a seed and helped the teacher plant one of the starts. Every day since we noticed our seeds sprouting, we have visited our garden beds on the way out to recess. The children have been keeping an eye on all of their plants but especially our strawberry plant. When we planted our strawberry plant right in the middle of our garden it had the beginnings of several strawberries. It is the centerpiece of our garden and the topic of much conversation among the children. One of the strawberries ripened quickly and by the time we picked it, it had begun to rot a bit underneath. That one little inedible strawberry spurred a great discussion and learning experience for the kids. They noticed two other strawberries beginning to turn pink and were determined not to wait too long to pick those! Finally the day came when those two strawberries were ripe. With a plastic knife and a paper plate, my 20 students and I picked the strawberries on our way to recess. I explained to them that everyone would get a taste and we talked about the size and amount of the strawberries and the amount of children, so they understood their sample would be small. It didn’t matter to them; they were still so excited, some literally bouncing and exclaiming in delight. I told them I’d sound the whistle when I had the strawberries ready for them but very few of them went very far, instead staying close, watching and waiting.